One of the best things I saw at D: All Things Digital had absolutely nothing to do with technology, so I’m not going to blog about it at PC World. Here, however, there are no rules. So here, after a brief commercial message, is Jill Sobule singing a kind of amazing song about…Bobbie Gentry. Posted by HarryPosted on May 31, 2007 Leave a comment on Billie Joe Lives! –George Lucas, this afternoon at D: All Things Digital, which I’m blogging about at PC World. Slate has been one of my favorite sites for a long time, and I’m happy to say that I’ve been doing a little writing for them lately. Here’s a new piece on GrandCentral, a service for folks with too many phones. Meanwhile, Slate has taken notice of the 1943 Disney employee manual that Jerry published on Cartoon Brew and linked to it–neat! I’m beginning to bring existing content on this site into WordPress, and at least in some cases, I’m enjoying revisiting stuff I’d more or less forgotten was here. This remains a thing of bizarre wonder. Mike Barrier has a fascinating, fascinatingly-illustrated piece on recently-discovered story sketches by Webb Smith for the landmark flypaper sequence in Playful Pluto. Or maybe they’re visual notes by that sequence’s animator, Norm Ferguson. Or possibly they’re by someone else. Like Mike, I hope the collective wisdom of smart animation scholars can come to a definitive conclusion about who did these sketches–but even if it can’t, they’re a major find. Visit AOL Video–which is, of course, owned by the company that also owns Bugs Bunny and cohorts–and you’ll find an odd mishmosh of cartoons that seem to skew towards the less memorable Warner Bros. efforts, and which, confusingly, includes links to Warner cartoons on other sites, such as YouTube, that have already been deleted. Perhaps because they violated Time Warner copyrights. Which leaves one wondering why an AOL service linked to them in the first place. By almost any measure, this has been the most eventful month of my life. I started it by quitting one of the best jobs in the world, a move that attracted far more interest than I ever dreamed it might. And then I returned to that job–something I never, ever expected to do–after an utterly improbable sequence of events. More important, I also marked the start of the month by becoming an uncle, as a happy side effect of the fact that my sister became a mother. So it’s kind of been a time for new beginnings. 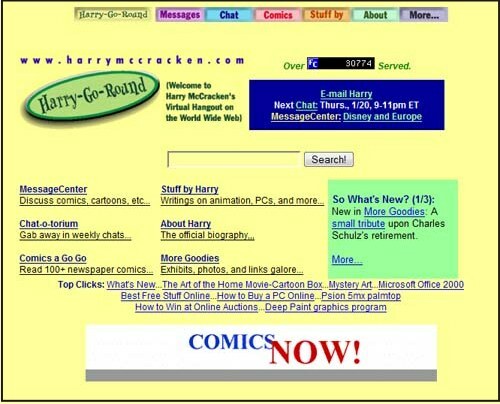 What better month to relaunch Harry-Go-Round? First, a word or two about why I’ve let the site fester for so long. For one thing, I’ve been busy. But even when I made time to work on the site, I faced a crippling onslaught of spam, both on my blog and message board. And I wasn’t crazy about the blog platform I was using, in part because it was so spam-ridden, and in part because it just wasn’t much fun to use. So I’ve dumped most of the technical underpinnings of the old Harry-Go-Round. I’m now blogging via the wonderful, wonderfully customizable piece of software known as WordPress, which I believe will let me evade the spammers who trashed my old blog (curse you, “Sten,” whoever you are). I’d like to revive my MessageCenter, too–but haven’t found a modern forum platform I really like. If I do, I’ll bring the MessageCenter back, although I frankly don’t think its loss is a huge tragedy. I may blog a bit more about things outside of the world of cartoons and comics here on out–other aspects of pop culture, maybe some tech, possibly even a little more personal stuff. We’ll see. Mostly, I’ll just try really hard to keep the site out of limbo from here on out. A) One thing that never disappeared was my weekly Sunday chats. We’ll be gathering tomorrow night, in fact. B) If you subscribed to my old blog via an RSS reader, please resubscribe with one of the links to the left. C) If you encounter any technical problems with the new site, let me know via the Contact Harry link above. Thanks! Posted by HarryPosted on May 27, 2007 9 Comments on Back From the Dead!